Its nearly two weeks since the angels of death came calling in Sokoto, leaving behind a trail of blood and dead bodies. More than 40 lives were taken, the state still mourns the tragedy. ANKELI EMMANUEL reports. 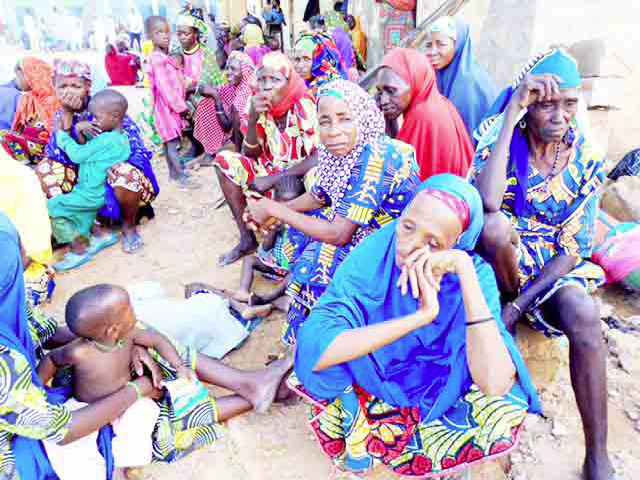 It was a time of fright, tears and disbelief for locals as angels of death sniffed out lives of over 40 persons within Tabanni village of Rabah local government area in Sokoto state recently. The incident, which left thousands of villagers and members of other neighbouring villages jittery, has further led to massive exodus of the locals in search of a safer abode for the uncertainty and fear of which village is next on the list of the bandits. With their heads in their palms, the over 4000 traumatised villagers who were from Tabanni, Kursa, Warwanna amongst others, said they are left with nothing to call their own as the attackers set all their barns and houses ablaze. Narrating bitter tales of the attack, 20 years old Gagi Lawali Tabanni said they were aware of the activities of these hoodlums for a very long time now. According to him, their attackers have been operating along the fringes of border villages between Zamfara and Sokoto states and do come to buy things from some Sokoto villages, while openly wielding their AK 47 riffles. Gagi pointed out that they have been living consistently in fear of attacks by these bandits hence they try not to offend them. “These bandits will at their own discretion send messages that the villagers should contribute some amount and give them as ransom or risk kidnapping. And for the sake of peace, the villagers will do as directed. “They will come and steal our cows, sheep and ram at will and we cannot confront them because they are heavily armed. These bandits have stolen over 200 of our cows. Few days before the recent Sallah celebrations, the bandits came to our village and carted away with over 60 broad-shouldered cows, which we use in our farming activities”. Narrating how Tabanni village was attacked on that fateful day and how he miraculously escaped being killed, Gagi said, it all started at about 3; 30pm after most of the locals where back from the farm and were taking a rest in clusters. According to him, the gunmen numbering over 100 all came on motorcycles with each of the motorcycles carrying at least three attackers. “All the three passengers on each motorcycle carried AK 47. They also hung the traditional machete. They entered our village in a commando style, took locals unawares and started opening fire at everything in sight. “They gunmen were very desperate to ensure that no one escapes. “On hearing consistent gunshots, I ran towards the northern direction and I saw attackers chasing and hacking people down with their motorcycle. I stopped and took cover for sometime before running out for my life into the bush for survival. “I was very lucky to have escaped because I saw how their bullets were bringing down people. I equally jumped over other corpses. I ran for over 2 hours chaotically. I trekked a whole day in the bushes to get to safety”, he said while still reliving the pains. Seated on the ground looking visibly shaken in their newly found safe haven, (IDPs camp) in Gandi village, 89 years old Innu Mudi recalled with nostalgia how gunmen in Tabanni village killed his only child, burnt down their house and barn. Innu who severely howled over how inhumanity has taken over the surface of the earth, placed a curse on those whose mission was to bring sorrow and pain to others. While blinking back tears, she stated in grief stricken words that her world has ended as those that attacked Tabanni village are simply messengers of dead sent from the pit of hell. For 25 years old, Muhammadu Nasiru, the Tabanni incident remained an unbelievable reality for him. Nasiru, married and a father of two, said, the gunmen chased him to a point that he almost gave up. “While the gunmen were running after us, they were equally firing shots. I escaped and hid inside a ceiling. They came and opened fire on the ceiling but I was very lucky that none of their bullets hit me. “The gunmen fired over 30 shots and left only to return after about 40 minutes. They were speaking, saying somebody is inside that place. But the only luck I had was that they never set the place ablaze”. Nasiru who affirmed that those that attacked Tabanni village were dressed in military garb added that, other villages bordering Zamfara state are not safe. “These bandits always come to rustle our cattle at will. They often compel villagers to pay certain amount depending on the size of the village or risk attack. Contrary to speculations that the bandits notified them before coming, Muhammadu Nasiru said, it was not true. According to him, if they had prior knowledge of the impending danger, they would have taken measures by informing relevant security agencies and inviting other vigilantes from neighbouring villages to join them in fighting the criminals. Speaking on the state of the Internally Displaced Persons (IDPs) in Gandi Model Primary School of Rabah local government when LEADERSHIP Sunday visited, the State Executive Chairman, Zakkat and Endowment Commission, Muhammed Lawal Maidoki said he feels bad and challenged over the incident. “I pity those who became the victims of this gruesome attack. Despite the fact that Sokoto remained the most peaceful state in Nigeria, this incident however does not come to us as a surprise because with God Almighty on our side we have tried to manage this ugly development for over two and a half years now. “Killings of this nature have continued to occur in Zamfara State where we have about six local governments bordering them but this kind of carnage has never befell us. “And even as at the time it happened in Sokoto, only one village was affected while the other two villages are in Maradun local government area of Zamfara state. “Though no matter how you try, sometimes you cannot prevent it from happening because it is destined to be. Sometimes, we look at it as a test from God to show His supremacy as the overall controller of the universe. “All the villagers that ran for safety out of fear because of what happened to Tabbani are more in the IDP here. The number is a challenge to us but we thank God the governor, Aminu Waziri Tambuwal has provided all that was needed. “About nine villages actually ran for their lives to Tabanni. Some are here in the camp while others are in the town. Some of the villagers equally ran to other local governments for safety. “We have 4993 displaced persons going by our records. About 93 persons are to be returned from Wurnu local government. in Gandi IDP, we have 4803 persons for now. “Total population of men is 1062, women are 1689, and female children are 1214 while male children are 871. These IDPs are from Tabanni, Kursa, Warwanna villages amongst others”. While stressing that others ran for safety to other local governments as well, Maidoki divulged that the IDPs are well cared for. “The state government constituted a committee of which I am a member to be in charge of the IDPs. We were given 300 bags of rice with some money for a start, after which the governor gave another 1000 bags of rice, bags of garri and other foodstuff such as beans, millet and 100 cans of vegetable and palm oil, detergents, mattresses, mats and many other things that will be required for their temporary comfort. Apart from the governor, two Senators came and contributed in assisting. Former governors equally came to the aid of the victims by giving assistance”. While stressing that the camp has other temporary facilities such as water, toilets, bathrooms and clinics, Maidoki divulged that about 8 children have been delivered in the IDPs. He however appealed to the federal government to be more proactive in tackling the security challenges confronting Nigeria and Nigerians. “We must continue praying and unite against evil irrespective of who that person is in the society. We should equally show love to one another and try to come to the aid of these IDPs because today it is them but tomorrow you do not know. I want all Nigerians irrespective of religion, region, and ethnicity or political affiliation to see each other as brothers, join forces against evil and to continue praying against all forces of darkness globally. Visibly restless over the development, Rabah local government Secretary and council overseer, Alhaji Aminu Abubakar Gawo said, “Inanilahi that such a thing has happened to them and the state for the first time. It is really a tragedy for us as it affects everybody. Our payers for those who have lost their lives are that Almighty Allah should grant them Aljanatu Fidausi”. While debunking insinuations that the affected villagers were given prior notice, Aminu Gawo said that was far from the truth. “The bandits came without the knowledge of the locals. As at the time the bandits came, the villagers were even in mourning and receiving condolence over the death of one of their own before they suddenly swooped on them shooting everybody at sight. “The bandits are not foreigners because all of them were said to be wearing soldiers’ uniforms. They rode on about 30 motorcycles with three people on each and all with AK47. “After everything, the gunmen burnt down every place where foodstuff and other valuables are stored. They however did not touch their houses”, Aminu Gawo said. Looking tired by the development, the Yarin Gandi, Alhaji Muhammadu Maccido said, he is still in shock on what has taken over the minds of men that has caused them to be so brutal. A survivor, who simply gave his name as Ibrahim said their attackers were herders who do not pasture livestock but permanently reside in the forest paving way for others to pasture their flock. According to him, he was very lucky to have escaped the unimaginable firearms of the killers adding they were professionals in handling weapons. “I have been hearing herdsmen, gunmen and bandits attack and killing villagers plus setting their houses ablaze with impunity. However, I continue to ask how would somebody just come to your place and kill you without any provocation? “But now, I am apologising to all those that were once attacked by these groups of senseless killers. I have seen that they attack at will even without provocation. They are really on a mission to stop farming in Nigeria. They burnt down all our foodstuff and houses. Where do we go from here as we no longer have a place to call our own? Recently the state governor, Aminu Waziri Tambuwal had personally attended the burial of the first 32 corpses recovered by the locals. Tambuwal maintained that over 10,000 villagers who for fears of the unknown have congregated in four Internally Displaced Persons Camps. “Government will continue to work with all security agencies in ensuring the safety of the people especially at these difficult times of such need. “Our presence here is in order to sympathise with the victims of this unfortunate situation and assure them of the necessary security and relief materials. “This is in order to ease their suffering most especially at this difficult time of need. “We will continue to supply relief materials and medical assistance as well as ensure speedy rehabilitation of the victims to their various communities. “This is as the government is working with all security agencies in the state in order to arrest the situation as quickly as possible,” Tambuwal assured. The Speaker, Sokoto State House of Assembly, Alhaji Salihu Maidaji, State Commissioner of Police, Murtala Mani, State Commandant of Nigeria Security and Civil Defense Corp (NSCDC) Babangida Dutsinma among other sympathisers were all on ground to access things for themselves. Speaking when six governors of the All Progressive Congress (APC) led by Nigeria Governors Forum Chairman and Zamfara state governor, Abdulaziz Yari came on a condolence visit, Tambuwal said, this is the first time such an ugly incident was happening in the state. Tambuwal who imagined what the mission of the assailants could have been to cause so much destruction and pain, said they only maimed, killed and left without taking anything from their victims. On his part, Yari decried the extent to which human lives are being wasted unabated in Nigeria. “We have come for a mission. First, to condole you, the governor, the families of the deceased and the entire people of Sokoto state over the serious loss of lives. We should have been more than these in number should but for other commitments, we decided to come on behalf of others. “Ten days ago, we were in Plateau state for a similar condolence and today, here we are in Sokoto state”. Yari further admonished leaders to stand up to the challenge, saying despite sabotage, he is optimistic that leaders can do more to curtail the spate of insecurity. “Sokoto state has been very peaceful despite security challenges faced by neighbouring states. Therefore, if insecurity is creeping into Sokoto, it is very worrisome,” Said Yari. Others who came with Abdulaziz Yari for the condolence were governors of Niger, Borno, Jigawa, Katsina and Adamawa states. A delegation from the federal government led by the Minister of Interior, Lt. Gen Abdulrahman Danbazau (rtd) further described the incidence as most unfortunate. Danbazau who divulged that President Muhammadu Buhari was personally pained over the ugly incident, noted that they were in the state for an on the spot assessment as well. The interior minister while stressing that the federal government is working round the clock towards finding lasting solution to such killings, assured that they would collaborate with the state to ensure that those behind such killings are apprehended and made to face the wrath of the law. Danbazau noted that the federal government is doing everything possible to guarantee adequate security of lives and properties of Nigerians. Deeply pained by the visible agony in the faces of those who were there, one would be tempted to conclude that the attackers have desecrated the land, as Sokoto being the Seat of the Caliphate is to remain a symbol of peace against all odds. Like Tambuwal, other leaders of thought across the country, especially from the North Central states continue to insist that the killings was all about occupation to forcefully acquire peoples ancestral lands. For others, if killings for occupation were the reasons for such attacks, then Sokoto should have been immune to such attacks because it is a very dry area with little rainfall. “If Benue, Taraba, Plateau, Adamawa and others facing severe security threat by these yet to be identified terrorists is because of land for ranching, what can you say is the cause of consistent attacks in Zamfara, Birnin Gwari among others and now Sokoto state? Tambuwal was said to have lamented through a statement that Nigeria “cannot progress and be part of a 21st Century forward looking world by creating new batches of mourners every other day. The statement which was a condolence to the families of those policemen earlier killed in Abuja said every Nigerian is no longer safe. “The question from every law abiding citizen today is: who will protect us, when even those constitutionally charged with the responsibility of protecting our lives and properties have, themselves, become vulnerable targets of criminals? Tambuwal who reiterated his call for overhauling of Nigerian security architecture said, even those charged with the responsibility of protecting lives and properties of the common man have themselves become endangered species. escorting. A few days later, four police officers were ambushed and killed in Benue State. “Last week seven policemen were reportedly gunned down in cold blood in Abuja, and their arms and ammunition taken, by unknown persons. This is happening amid repeatedly reported cases of attacks on police stations and other security facilities in various parts of the country. “It bears repeating for me to state here that Nigeria’s security architecture and the strategies currently adopted and deployed for national security, if any, need a comprehensive overhaul. “It is not working. The needless waste of lives everywhere, both those of trained security personnel and ordinary citizens, is a drain on the nation’s resources and an unacceptable diminution of our valuable human capital”. is undermining our humanity, added that if not checked on time it might not only make Nigerians less sensitive to the gravity of the situation but create a new generation who may get accustomed to inhuman acts as the norm.